Gleevec is like the proverbial shining city on the hill in the pharmaceutical business. When it was first approved in 2001, it beat the long odds of drug development, becoming one of the first targeted cancer therapies. It lived up to the hype, turning a deadly form of cancer into a chronic illness. Even though fewer than 6,000 people get chronic myeloid leukemia each year in the U.S., the drug still made billions of dollars. Plenty of people in the pharma industry tried to duplicate or iterate on what Novartis did in the imatinib (Gleevec) story. Lots of drugs came next, seeking to inhibit kinase enzymes like Gleevec did. Few had such a profound impact on patients. But now, more than a decade later, a little company in Cambridge, MA, called Blueprint Medicines has reunited a scientific trio who gave the world Gleevec — Nick Lydon, Brian Druker, and Charles Sawyers. The startup, backed with a $40 million Series A financing from Third Rock Ventures and Fidelity Biosciences in 2011, is making a bold bet that the time has finally come for a team to start cranking out more precisely targeted cancer drugs like Gleevec. The idea, described by CEO Chris Varma, is to use today’s superfast/supercheap DNA sequencing instruments to systematically comb through the genomic abnormalities that give rise to cancer. Once new potential drug targets have been found, Blueprint’s chemistry team quickly builds libraries full of specific, and potent, small-molecule drugs to hit kinase targets like the one that Gleevec blocks so well. 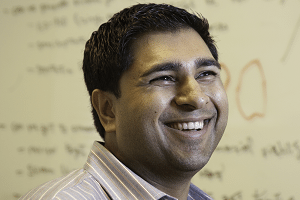 In its first two years in business, Blueprint has scanned broadly across the 500 or so known kinase targets in the “kinome” and synthesized its own libraries of proprietary drug candidates that can selectively inhibit about three-fourths of them, Varma says. This week, the company took another small step ahead, striking a partnership with the U.K.-based Sanger Institute and Massachusetts General Hospital to see how legit some of these candidates are. Blueprint and its collaborators are now going to test Blueprint’s drugs against 60 different kinase targets, in 1,200 different human cancer cell lines in the lab. Blueprint has already run its drugs through a few cell lines in its own lab, but this is a tougher test, to see just how many of its drugs have promise against such a diverse set of tumor types. Blueprint doesn’t expect to come away from this collaboration with a one-size-fits-all widget for a common condition like breast cancer. While drug developers of the past might have shied away from rare malignancies, Blueprint’s great hope is to find treatments for a couple types of cancer with names few people have ever heard of. Pfizer’s crizotinib (Xalkori) is one of these kinds of drugs. It works for 4 percent of non-small cell lung cancer patients with a mutated ALK gene. Before this drug came along, the ALK gene didn’t exactly roll off the tongue of people in the business. But it does now, because it’s a mutation that’s easy to screen for, the Pfizer drug is highly effective for ALK-mutated patients, and sales have been good for the company. That’s the kind of story Blueprint is hoping it can tell over and over again, for cancer patients with strange gene mutations. That is a dream, not possible with current DNA sequencing instruments. Most of the current DNA sequencing technologies provide short reads. It will be humongous task (nearly impossible) to sequencing cancer genome for a more accurate picture of copy numbers, orientations of amplified regions and SNPs present in cancer. Even if accomplished, it certainly not be cheap, not super fast and certainly not super cheap. To accomplish what Blueprints Medicine wants, one desperately needs very very long reads. Even long read, claimed by Pac Biosciences will not good enough. Oxford Nanopore is one option but NGS community have started developing serious doubts about it, due to lack of data. ZS Genetics may offer the longest reads suitable for Cancer genome, but its technology is being developed.